Nearly a week ago, we told you about leaked specs for BlackBerry's next handset, the DTEK60. The FCC has certified the phone with a model number of BBA1001. The Wi-Fi Alliance lists the handset as both the BBA100-1, BBA100-2 and the DTEK60. The unit will be a high-end handset compared to the mid-range BlackBerry DTEK50, which is a re-branded Alcatel Idol 4 with an added Convenience key. The DTEK60 is rumored to be a re-branded version of the TCL 950. 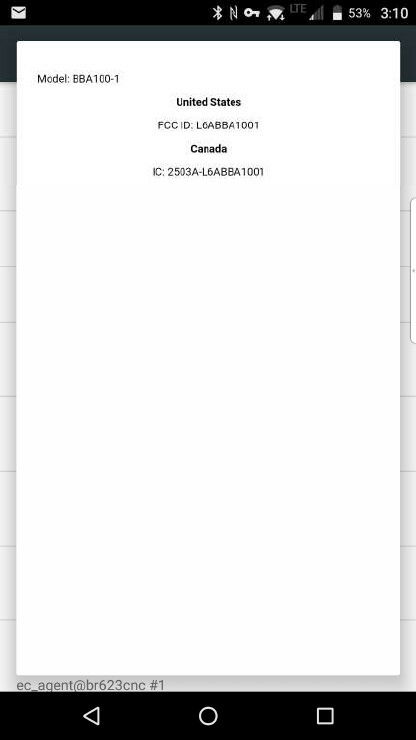 While unannounced, the TCL built phone has been certified by TENAA and has been put through the GFXBench benchmark test. TCL, by the way, is the parent company of Alcatel. We expect that the DTEK60 will be equipped with a 5.5-inch screen carrying a 1440 x 2560 resolution. The Snapdragon 820 chipset will be driving the handset featuring a quad-core CPU and the Adreno 530 GPU. 4GB of RAM is inside along with 32GB of native storage. A 21MP camera graces the rear of the phone and there is an 8MP front-facing snapper for selfies and video chats. A USB Type-C port is included as is, for the first time on a BlackBerry handset, a fingerprint scanner. The Convenience key returns and Android 6.0.1 is pre-installed. This will be an all-touch model with no physical QWERTY keyboard. With BlackBerry able to cross off the FCC visit on it's "to do" list, we could see the phone unveiled shortly. BlackBerry with a new handset? But I thought they were shutting down their hardware business? *He said sarcastically*. Nice specs. I want to see the final product in action. Glad that you're glad that I'm glad. And it's a rebranded 4s Pro. You're welcome. Meh, it's all contracted out to one Chinese manufacturer anyway and I'm sure there are phones from smaller brands in China sporting the same or similar design. Good observation I'll give credit where credit is due. WHAT? so what was that shutting down story? The same story that gets repeated every time BlackBerry's earnings report is due. The shutting down story is still in the rumor mill, not yet confirmed by Chen. They could be shutting down and outsourcing. Honestly, I think they're better off doing that as long as they make the devices affordable unlike the Priv was. And make them universally unlocked. DTEK50 is affordable, and they're already outsourcing. Next. Oh I'm sorry, I forgot to run any corresponding blackberry comments through the resident blackberry superfan. Stop being salty because I corrected your $#33p-like, zombified @$$. You do realize that comment applies to you, right? Awesome deflection. You're a pro at it. You're a pro at losing arguments. I guess this will be their flagship for this year, but not sure I'd call it the sequel though as the dtek50 was just recently released. The 50 was always a mid-range phone. No sequel. BLACKBERRY PRIV WITH BLACKBERRY 10 OS WOULD BE A WIN WIN SITUATION FOR BB FANS . A win win for the few isn't win win for BlackBerry in terms of profit. I don't remember thanking you or asking for your correction. Doesn't mean you didn't need it. No need to thank me. It was my pleasure. You're one to talk about correcting someone with the many errors you make.